Jesus invites people to enjoy all the benefits of God's family. This clear, brief message explains how Jesus' substitutionary death and resurrection made such an offer possible, and it urges readers to RSVP as soon as possible. - Publisher :Jesus invites people to enjoy all the benefits of God's family. This clear, brief message explains how Jesus' substitutionary death and resurrection made such an offer possible, and it urges readers to RSVP as soon as possible. 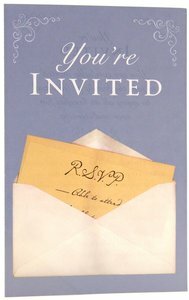 About "You're Invited KJV (Pack Of 25)"
:Jesus invites people to enjoy all the benefits of God's family. This clear, brief message explains how Jesus' substitutionary death and resurrection made such an offer possible, and it urges readers to RSVP as soon as possible.